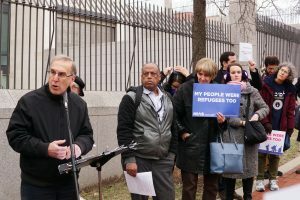 Note: These were remarks given at a Pre-Passover Vigil held in front of the Embassy of Israel in Washington D.C. on March 27, 2018. I am Rabbi Sid Schwarz. I am the founding rabbi of Adat Shalom Reconstructionist Congregation in Bethesda, MD; a life-long Zionist and a Board member of Truah: The Rabbinic Call for Human Rights. Three nights from now, we will sit at our Seder tables. The Seder tells our people’s master story which begins with our ancestors being slaves in the land of Egypt, in Africa. The triumphal moment in the story is the recounting of our ancestors’ redemption from slavery, allowing them to travel, through the desert to the land that God promised to Abraham, the land of Israel. The Seder is both an historical re-enactment and an ethical charge. Some years, we test our imaginations to make it a re-enactment. But that has not been the case the last few years. The world today is flooded with refugees, over 60 million. Each and every one of them is looking for their Promised Land, a land in which they and their families can be safe. In the past decade over 50,000 Africans facing war, oppression and death in their home countries crossed the same desert that the Israelites crossed in the Passover story—the Sinai–and entered into the State of Israel. Israel is not the only country in the world facing this dilemma. But it may be the only country in the world founded on the principles of the Hebrew prophets. “The stranger who resides with you shall be to you as one of your citizens; you shall love him/her as yourself for you were strangers in the land of Egypt” (Lev 19:34). In the Haggadah we read: Kol dichfin yatai veyachol –“let all who are hungry, all who are needy, come into our homes and eat.” This is the ethical charge of the Passover Seder. Jews are rightfully proud of the state of Israel and its accomplishments. It is a country that has been settled by and built by refugees. After WWII, Israel offered a refuge to the Jews of Europe who were decimated by the Holocaust. In the 1950’s Israel took in Jews from Arab lands. In the 1980’s Israeli’s engineered a remarkable rescue of Jews from Ethiopia. And, in the 1990’s Israel took in almost a million Jews from the FSU. Wherever Jews have faced oppression, Israel has been a place of refuge. But the true test of Biblical hospitality is opening our gates to those refugees who are not part of the majority culture. The government of Prime Minister Benjamin Netanyahu has announced that starting next week, Africans who came into the country illegally will be deported to Rwanda or Uganda. Tens of thousands of Israelis have protested the decision, arguing that such an action violates a core principle upon which Israel was founded. In that same spirit, over 900 rabbis have signed a letter to Prime Minister Netanyahu, co-sponsored by HIAS, the New Israel Fund, Truah: The Rabbinic Call for Human Rights and Right Now: Advocates for African Asylum Seekers in Israel. I am proud to be among the signers. In the Biblical story of the Exodus, we are told that Pharaoh “hardened his heart” against his Hebrew slaves. We know what hard hearts look like. In the United States it is promoted as America First and it threatens 3.6 million undocumented immigrants and 800,000 “dreamers” who came to this country as children. Hard hearts are contagious. We now read of Hungary First, Austria First, Italy First, Myanmar First. Each of these countries has its unique victims. And now, Israel First. For every country that closes its heart and closes its borders, the most destitute people on our planet suffer. We are here today, on the eve of Passover, the holiday of freedom, liberation and justice, to call for a new spirit. Rather than country first, how about compassion first? Instead of ethnicity first, how about hospitality first? Instead of me first, how about justice first? Let Israel be a light unto the nations in the way it treats its refuges. 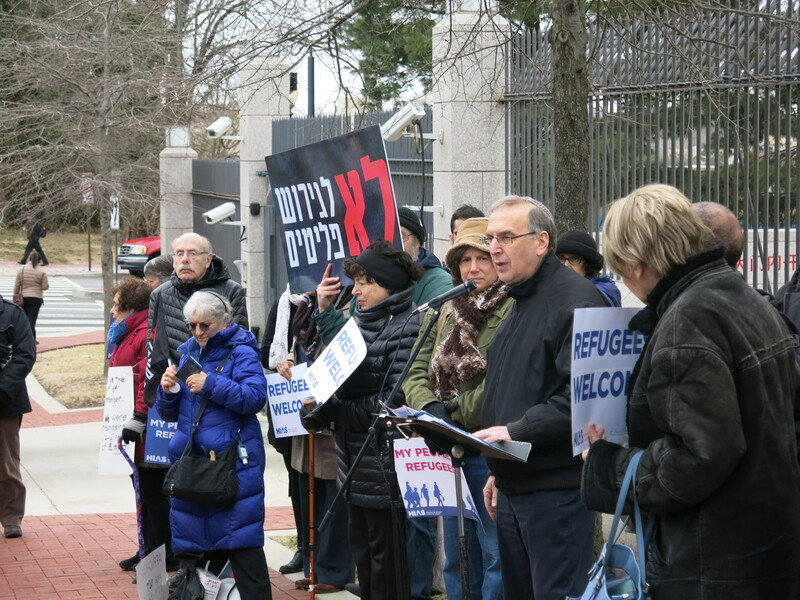 Kol dichfin yatai veyachol –“let all who are hungry, all who are needy, come into our homes and eat.” Let the Passover season inspire us to open our hearts, open our homes and open our countries to the strangers in our midst. That would be a Passover worth celebrating. These remarks were published in the New York Jewish Week on the same day as they were delivered.